On 24 November 2014, nine students successfully completed and graduated from the Master of Science in Environmental Governance with Specialization in Biodiversity, a programme that was previously offered by the UNU Institute of Advanced Studies. When UNU-IAS was established on 1 January 2014, it consolidated two previous UNU institutes, the UNU Institute of Advanced Studies and the UNU Institute for Sustainability and Peace. 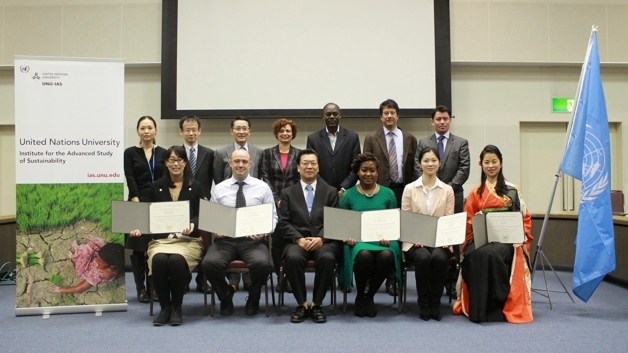 The graduation ceremony, held at UNU headquarters in Tokyo, featured congratulatory remarks from Braulio Ferreira de Souza Dias (Executive Secretary, Convention on Biological Diversity) via a video message, and special lectures by Yoshiki Yamagata (National Institute of Environmental Studies) and Kazuo Watanabe (University of Tsukuba) on biodiversity governance in local and global contexts. The programme’s partnership with the Secretariat of the Convention on Biological Diversity (CBD) reinforced links between UNU-IAS and other UN organizations. The students took up various topics related to CBD in their research, including access and benefit sharing of genetic resources, biodiversity aid, the role of business in biodiversity conservation, and land tenure in forests. UNU graduates from the programme have gone on to work in business, government and the non-profit sector. In the field of biodiversity, alumni have already contributed to CBD negotiations as part of delegations participating in the twelfth meeting of the conference of the parties to CBD (CBD COP12) held in the Republic of Korea in October 2014. The students who completed their degrees this fall were the third and last cohort of students to graduate from the programme, as it was integrated into the Master of Science in Sustainability programme of UNU-IAS from September 2014.